Burglary – 5/3 S. Redwood Ave.
Donald E Schaefer, Jr, 31, of Middle River, MD was arrested on by Ofc. Paul Smith April 28 for obtaining CDS by fraud and possession of CDS. Nicole Lyall, 28, of Egg Harbor Twp. was arrested by Det Ryan Goehringer on April 30, for theft. Adam. Rosen, 29, of Galloway was arrested Ofc. Ronald Gorneau on April 30 for possession of marijuana under 50 grams and possession of CDS paraphernalia by. Richard M. Barber, 37, of Galloway was arrested by Ofc. Prezmyslaw Ryba on May 1 for possession of CDS and possession of hypodermic needles. Allison L. Fisher, 22, of Egg Harbor Twp. was arrested by Det. Bryan Casey on May 1 for obtaining CDS by fraud. Charles Flippen, 55, of Hammonton was arrested by Ofc. Patrick Neal on May 1 for criminal trespass. Thomas J. Andrews, 45, of Galloway was arrested by Ofc. Patrick Neal on May 2 for DWI. Abdul Abullah, 18, of Galloway was arrested by Ofc. Rita Abatemarco on May 2 for hindering apprehension, obstruction and possession of marijuana under 50 grams. Thomas J. Capece, 32, of Millville and Lynnette T. Wood, 29, of Mauricetown were arrested by Ofc. Patrick Neal on May 3 for theft and possession of burglary tools. Joseph L. Panter, Jr , 55, of Atlantic City was arrested by Ofc. Kerry Baerman on May 3 for shoplifting. Timothy C. Wells, II, 25, of Buena Boro and Rena R. O’Donnell, 22, of Galloway were arrested by Ofc Kevin Costa on May 3 for two counts of possession of CDS each. 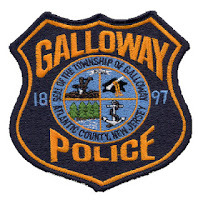 Michael J. Jordan, 41, of Galloway was arrested by Ofc. Robert Bauer on May 3 for criminal mischief. Adam Dolphin, 26, of Aston, PA was arrested by Ofc. Kerry Baerman on May 4 for possession of CDS and possession of CDS paraphernalia.